Entering Wednesday's game against the San Francisco Giants, Reds' leadoff hitter Orlando Cabrera was sporting a 0-12 mini-slump. Cabrera led off the first inning with a single and scored on a Scott Rolen double giving Aaron Harang and the Reds an early 1-0 lead. Cabrera ended the day going 4-5 with three doubles and three runs scored. Scott Rolen went 3-3 driving in two runs with two doubles and Jonny Gomes went 1-2 with three RBI. Combined, the trio went 8-10 with six doubles. 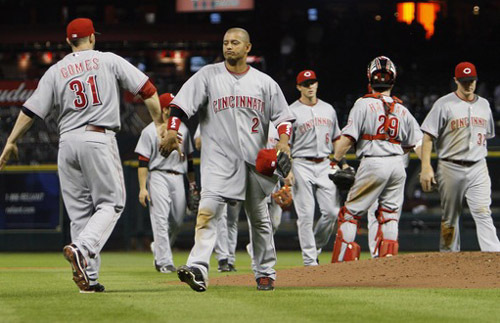 Aaron Harang started for the Reds and went seven innings. Harang allowed only five hits while striking out three. After retiring the first five Giants' batters he faced, Harang walked Pat Burrell, and Buster Posey hit his first career home run into the left field bleachers at GABP. After Harang left the game, Danny Herrera and Logan Ondrusek combined for a scoreless eighth. The Giants scored again in the ninth inning off closer Francisco Cordero, but could not overcome the six runs the Reds had already put on the board. The Reds defeated the Giants 6-3 and gained a one-game lead for first place as the Dodgers completed a three-game sweep of the Cardinals on Wednesday night. "We're going to the playoffs because we have him on our team." Mike "Godzilla" Leake (5-0, 2.22) will face Todd Wellemeyer (3-5, 5.72) and the Giants at 12:35pm on Thursday.